Rescuers and medics say at least 70 people have died in Syria in a suspected gas attack in Douma, the last rebel-held town in Eastern Ghouta. Volunteer rescue force the White Helmets tweeted graphic images showing several bodies in a basement. It said the death toll is likely to rise. 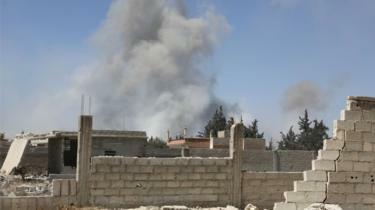 Syria's government has called the allegations of a chemical attack a "fabrication". The US state department said it is monitoring the "very disturbing" reports, and that Russia - which is fighting alongside the Syrian government - should be held responsible if deadly chemicals had been used. "The regime's history of using chemical weapons against its own people in not in dispute," said the state department. It said it believed at least 40 people died, but that the toll may be far higher. Several medical, monitoring and activist groups reported details of a chemical attack, but figures vary and what happened is still becoming clear. The pro-opposition Ghouta Media Center tweeted that more that 75 people had "suffocated" while a further thousand people had suffered the effects of the alleged gas attack.